The Virtual Institute (Vi) is UNCTAD’s programme of support to academia. Launched in June 2004 with universities representing five countries, by August 2016 the Vi had grown into a true global network of 131 universities and research centres in 64 countries. The ultimate objective of the Vi is to help developing countries design evidence-based policies that result in inclusive and sustainable development. To this end, the Vi enables academic institutions to prepare qualified decision-makers and provide analyses to underpin the formulation of economic policies in their countries. The first track of the process focuses on building a critical mass of qualified practitioners at the national level by helping universities develop or upgrade their academic offer, and enhancing the capacity of academic staff to teach trade and development topics. 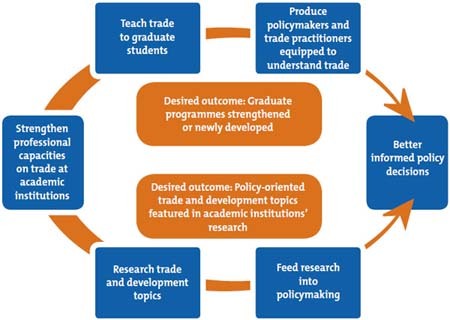 The second track links research with policy by equipping academics with subject-matter knowledge and the analytical tools necessary to undertake policy-relevant research for their countries, and facilitating the exchange between researchers and national decision-makers.